In October of 2010, Google launched a major change to its local search listings.. As part of the implementation, there was a potentially big change for paid search advertisers. 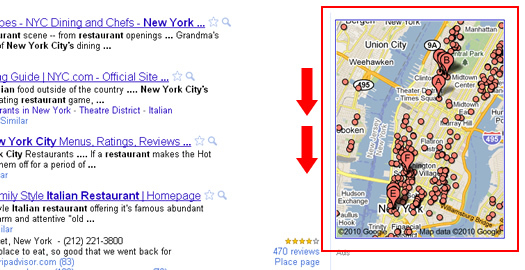 When Google displayed local listings (based on a query it deemed local in nature), it would show a map in the upper right-hand corner of the search results. That’s fine, but that’s not all the map did… As you scrolled down the page, the map scrolled with you. If paid search listings were present on the right-hand side of the page, then the map covered the paid search listings as it scrolled. As you can imagine, this could have a big impact on the performance of your AdWords campaigns. As I was testing various local searches this morning, I noticed some strange behavior with the map I mentioned above. I noticed that it wasn’t scrolling for some searches, while it was scrolling for others. After analyzing those searches, it became apparent that the scrolling map functionality wasn’t working when there were paid search ads on the right side of the page (underneath the map). Then I tested searches that yielded no paid search ads on the right side of the page, and the map did scroll down the page. I noticed this behavior on my netbook using both Firefox and Chrome. Anyway, I took some screen captures of this happening and have provided the short videos below. I apologize for the poor resolution, but I had to take screen captures from my netbook. Regardless, you can still see what’s going on with the map. The first video shows a search for Italian restaurants in new york city (where there were paid search ads on the right side). The second is for a search for pizza in dallas, tx (where there weren’t any paid search ads on the right side). Google Instant Previews – Great Functionality or a Signal Back to the Mothership? In November, Google introduced Instant Previews, which enable users to trigger previews of webpages directly from the search results. You can trigger an instant preview by clicking the magnifying glass in the search engine results page (which is located to the far right of each listing). See a screenshot below in case you aren’t familiar with how to do this. According to Google, the core reason for adding instant previews is to offer users more visual information so they can choose the right listing within the search results. During its testing, Google found that users were 5% more likely to be satisfied with the results that they click after using instant previews. I definitely agree that this can help from usability standpoint, since Google shows you the destination page, along with additional information based on your query. For example, Google will highlight text within the instant preview that is relevant to your query (from the destination page.) Google will also present text callouts in orange that are highly relevant to your query. Again, view the screenshot below to see how this looks. When Instant Previews was released, many SEO’s started immediately thinking about how it could potentially impact rankings. Although Google states that this will not impact rankings, and it’s just for usability, it’s hard to ignore the fact that instant previews can send a powerful signal back to Google about the relevancy of the search results. For example, if a page is ranking near the top of the search results, but really shouldn’t (because it’s spammy, the page owner gamed Google’s algorithm to get there, etc. ), then Google could start to identify these pages via monitoring low click-through rate via instant previews. For example, imagine a page with 175K impressions in organic search, with 3500 instant preview triggers, but no click-through. That very well could raise a red flag to Google. 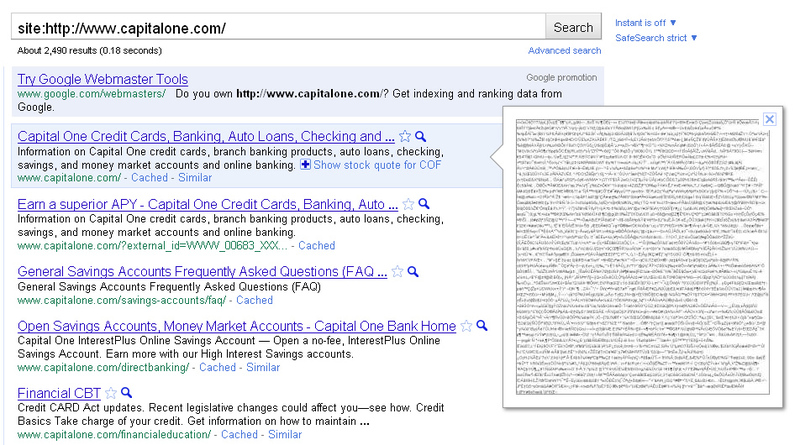 Data like this can be invaluable to Google for cleaning up the search results. Today, most people have come across pages that are currently ranking highly in Search that clearly shouldn’t be. But, most people just move on with their search without giving Google any direct feedback. By using instant previews and then not clicking through, users can send that important feedback to Google. Then, based on collecting enough information about a giving search result, Google could potentially impact the future rankings of that listing. Again, Google states this isn’t the case (at this point at least), but this sounds extremely logical to me. Instant previews can be just another signal that helps Google provide the right content to the right users, while eliminating low quality and potentially spammy content. Sure, instant previews help with usability, but it’s hard to believe Google doesn’t have an ulterior motive. And I’m totally ok with that. Actually, I hope they are using instant preview statistics as a ranking factor. If it can help weed out spammers and black hat marketers, I’m cool with it. First, error messages that show up in your instant previews can kill click-through. Think about it, someone is searching for your products or services, triggers instant previews, and starts checking destination pages. The user checks four or five previews and notices a critical error showing on your page (via the instant preview). Do you think they will choose your page and click through? Probably not, and if Google is analyzing this data to weed out poor results, then this can potentially impact your rankings. If your previews are showing errors, work with your development team to identify why that is. I’ve seen some sites where all of the previews are showing errors. Needless to say, if Google is having a hard time generating previews for your site, or if it is experiencing errors while crawling your pages, that’s definitely not a good thing. Actually, you might find that the errors in instant previews are the tip of the iceberg with regard to overall errors on your site. You should be aware that using flash or other special technologies to provide content on your pages can cause problems in your instant previews (for now). For example, check out the screenshot below for Target.com, which uses flash as a core element on the homepage. As you can see, Google is clearly explaining that ad popups and other elements that interfere with usability can cause problems in your instant previews. In addition, they explain that flash and some video content are not being rendered in instant previews. But, since Google owns YouTube, my guess is that this will be short-lived. I’m sure flash and flash video will find its way into instant previews. But, the main point is to ensure your previews clearly reveal your content, while not showing errors, missing content, or “puzzle pieces”. As I’ve explained above, instant previews are a great way for users to check out a page before clicking through to the site. Receiving visual feedback, along with viewing text callouts can help you find the right result faster. But, looking deeper into Google’s intentions, are instant previews sending signals back to Google about the relevance and quality of the search listings? Again, I hope that is the case. But, you need to make sure that your listings don’t become collateral damage. Make sure your previews don’t show errors or hide content. That sends a bad signal to users and to Google.